And when thou hast learned to spell my name correctly! 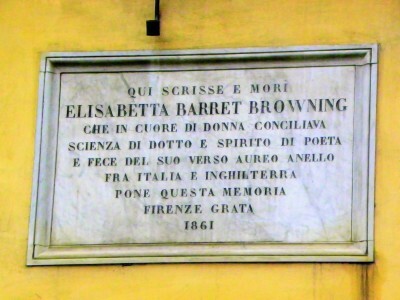 This is a photograph I took in Florence, Italy, recently, and it is an “Elizabeth Barrett Browning lived here” plaque, with some poetic writing about her-heart-of-a-woman, et cetera. That said, it spells her second name incorrectly – without a double T. Doppia T, Italians! What I love about it, as a student of the Italian language, is the use of the passato remoto and the imperfect. I took a translation course in Italy in February and it was really hard to get the hang of when to use those two together. It’s really not hard to get to the bottom of this: When you say that Jews have magical hypnotic powers to control other people, you’re an anti-Semite. When you say Jews control other people through money, you’re an anti-Semite. When you say Jews have conspired to force you to apologize for saying anti-Semitic things, you’re an anti-Semite. ­Ilhan Omar is an anti-Semite. Yeah, she is. As I have written before on this site, I am related to anti-Semites and watching the Democrats twist and turn to avoid calling a bigot a bigot reminds me so much of all of the apologists in my family. Very sad. Yet another area where I miss my oldest brother, who was always clear and true on these matters. George Harrison’s birthday – what would have been his 76th – was last week (February 25th). I am of the view, perhaps an unpopular one, that he was the best Beatle. (Another of my unpopular views is that the Monkees were better than the Beatles – and, of course, dear Peter Tork passed in February, bless him.) At the very least, I would say that “All Things Must Pass” is better than everything John Lennon and Paul McCartney did as solo acts combined. In tribute, here is a video of “What is Life,” one of my go-to songs when I’m blue. As Harrison never made a video for this song, his widow and son held a contest (after George’s death) for one to be made. This is what they selected and I find it wonderful. It is joyful with tinges of melancholy and confusion, as is the song. Hats off to the dancers! How has this not been made into a movie yet? And if it has, please send me a note and let me know. Elliott Abrams here shows far more grace than Omar deserves. And these days, so much of it is from the left. Bret Stephens, as usual, completely correct. Also: If the Jewish state is really so villainous, why doesn’t it behave more like Syria’s Bashar al-Assad or Russia’s Vladimir Putin — both of whom, curiously, continue to have prominent sympathizers and apologists on the anti-Israel left? Such a gift Michel Legrand had – hard to choose a favourite from his repertoire, but this song never fails to make me cry (although I do remember it being mocked on The Carol Burnett Show!). Haunting in French or English. It was used recently in The Trip to Spain. Andrew Sullivan can really shine, like here. For this day, please read my post from last year. I’ll admit that I had a strong and immediate reaction to the video clip of the students from Kentucky seemingly confronting and belittling a Native American elder. I was bullied quite viciously by an older brother (when I was seven he was already an adult, so there was a severe power imbalance) when I was growing up and so I have strong reactions to the sight of someone bullying or picking on another. I know the cruelty of that kind of madness. In this case, though, it appears all might not have been as assumed at first glance. These two stories are from sane sources – first from Reason, the second from The Spectator — and worth a look. I left Twitter a while back and this was one reason – the online mob is just painful to behold. Even if these boys were as nasty as initially suggested, I don’t think their lives should be ruined. This could be a teachable moment for them – they are very young, and I believe most of us can learn.